Frisco 18.5 or 24.5-Inch 2-in-1 Pet Steps come with two different height options to fit the needs of every pet family. 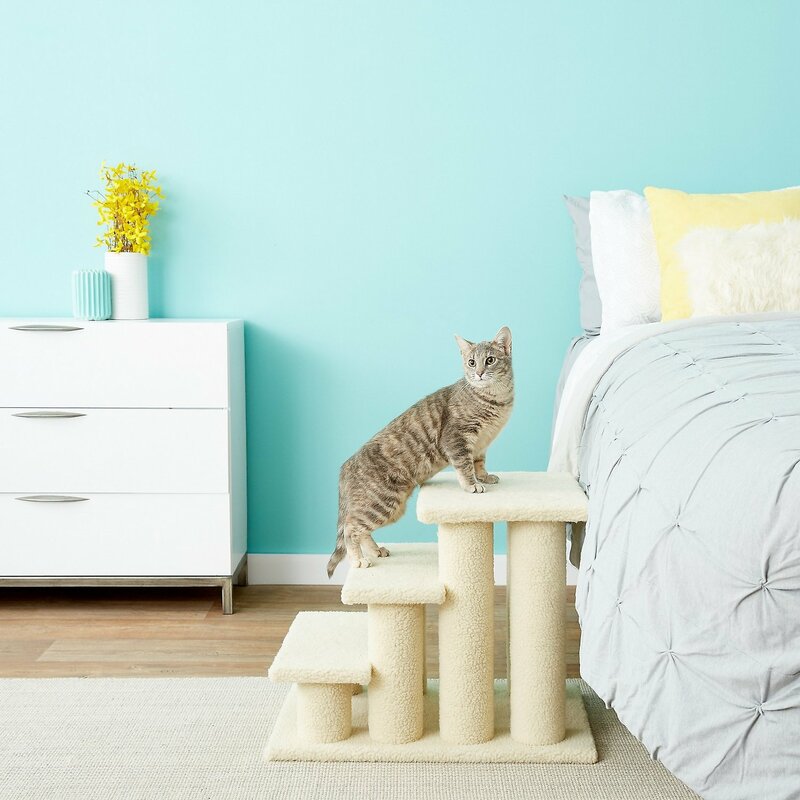 You can assemble them as three steps to reach lower heights, or as four steps so your pet can reach places that are higher up. They make a nice lounging and play area for kitties, and can be placed next to a windowsill or dresser that doubles as your cat’s favorite lookout perch. These versatile steps are also great for small dogs or senior pets that have trouble getting onto the couch or the bed. 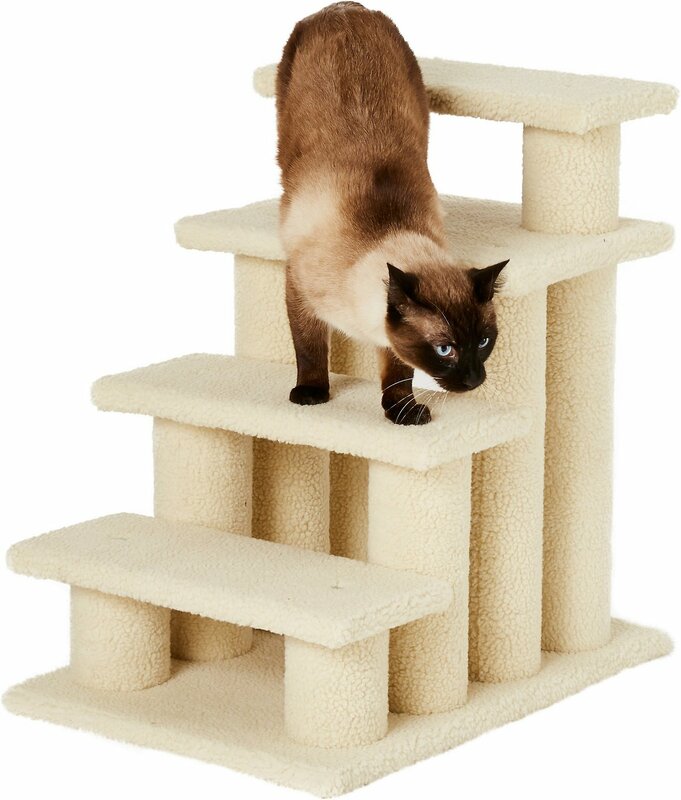 The soft faux fleece fabric is soft on the paws as pets climb the stairs, and cozy enough for cats to cuddle up for a nap. Frisco’s 19 or 24.5-Inch 2-in-1 Pet Steps come with an instruction manual for easy assembly. Versatile 2-in-1 pet steps can be assembled as three or four steps to give you two different height options. Serves as stairs for small or senior pets that might have a hard time getting onto the couch or bed. 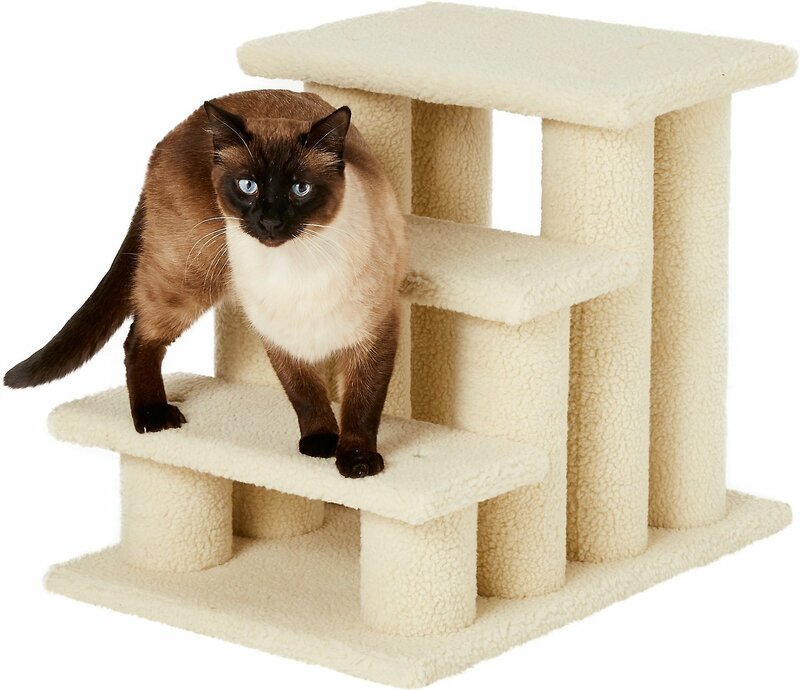 Helps kitties reach windowsills or dressers, and also serves as a place to play and lounge. Made with a soft, faux fleece fabric that feels soft on your pet’s paws as they climb. Gives cats a cozy place to curl up for a nap that’s higher off the ground. Comes in a neutral color and easy to assemble with an instruction booklet and all the tools you’ll need. We were looking for some pet stairs as we recently bought a house and we have wooden floors that our Cavalier King Charles Spaniels likes to jump down on to. We were concerned they would twist an ankle or land funny so we got these stairs. We couldn’t be happier! Both our dogs learned to use the stairs the first night we set them up with some treat guidance and now they don’t get up or down any other way. The steps are easy to assemble (took 5-10 minutes by myself) and they’re nice and sturdy (about 15-20 pounds?) so they don’t rock or tip over when used. I normally do not write reviews but this step has been a life saver. My 16 year old cat has arthritis and can no longer get on the bed. She was waking me up at night, numerous times, to put her on the bed. I had tried other steps in the past, without carpet, and she would not use them. This step is made well, easy to put together, and is the perfect height for the bed. Within 2 days she was using the step to get up and down. I am thinking about purchasing another one for other areas of the house. Both my cats love these steps! These steps are so easy to assemble! It took this 80 year old woman, less than half hour, only because I put the base on upside down, and wondered why there was no carpeting on that side. Oops! I already had the first two steps on, with Purrcy sitting on it while I worked. Then I saw my mistake and had to take steps off and start over. It was even quicker, second time, cuz I knew how to do it without looking at paper. The instructions could not be simpler. Just follow the numbers on the clearly marked parts. It is super easy for my little short-legged cat, to climb and get down. When I figure out how to post pics, I will come back. I have an overweight cat and was fearful she would injure herself jumping down from the bed. The assembly took a little time but wasn't difficult and it's very sturdy. I set it up for for the 18.5 inch height. Both cats use it and like to sit on the top step. Very pleased with this purchase. This is second item I've purchased from this manufacturer and I'm very pleased with the quality. These stairs are FABULOUS! When our aging cat began having trouble making the leap from floor to our bed to sleep with us at night, I took a chance on these Frisco stairs. They are easy to assemble (took us 15 minutes) with great diagrammed instructions. 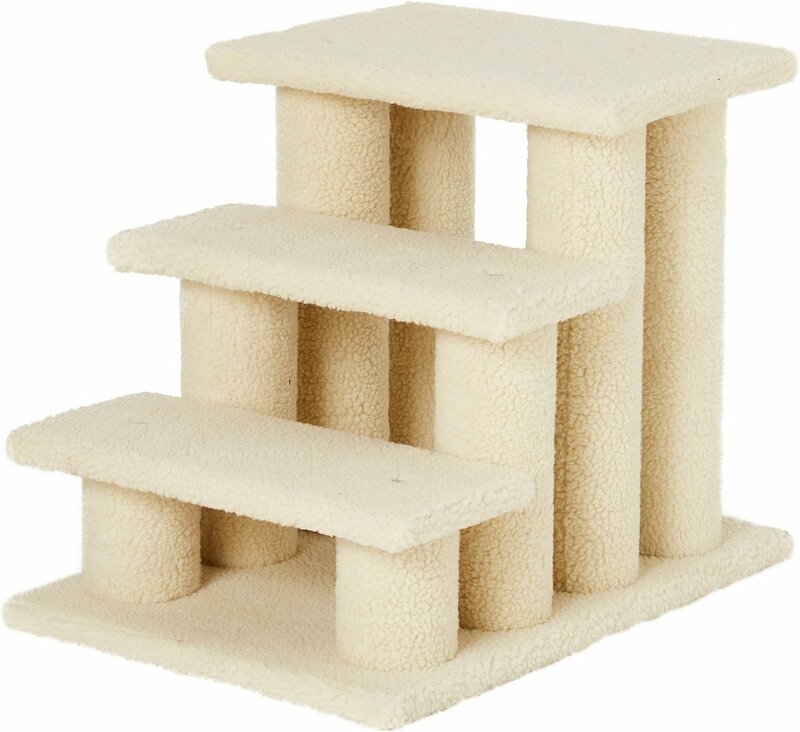 Soft, fuzzy carpeting lets our cat climb up and down with ease when placed next to our bed. Took him a few days to get used to this new pathway, but he's very comfortable "taking the stairs" now. The item arrived quickly in secure packaging. The instructions were clearly written and it included the only tool needed for assembly. I chose the 4 step option and even as a senior I was able to assemble it myself in about 15 minutes. My elderly, arthritic cat prefers to eat her meals up on a table and the 4 steps gives her a secure way to get up there. She figured out the steps as soon as they were finished. Only downside is the color. I would have preferred a navy or chocolate color choice. This is going to be hard to keep clean. Otherwise, it's perfect! I previously ordered a different one and it wasn't tall enough. This is perfect! It did require assembly (so easy and actually fun-no tools needed besides what was provided). My dog is using it (no more getting woken up to go up and down). I think the carpeting on the stairs gives him extra security because his paws get extra traction. It may get dirty over time but the price was fair so it's possible to replace. Thanks Chewy!